Crater floor dropping hundreds of feet. We like the moon – squeaky things singing badly and for some reason I find this very funny. Even spong monkeys know that the moon causes tides, unlike Bill O’Reilly. Viking kittens – yes the kittens and Led Zepplin. Penguins of Madagascar – love this cartoon. There are enough sly comments that adults can enjoy it immensely. Neil Patrick Harris recurs as the arch villain, Dr. Blowhole, a cybered dolphin. My favorite penguin is probably Rico, the demo expert. For some reason, I end up playing demo experts in role-playing games. Husband is real-life demo expert 🙂 Mort the lemur seems to be more spong monkey than lemur. Stuff Mort says. There are videos on youtube if you are inclined. I’m utterly musically inept. But I love these “harp guitars”. Here’s a tree just outside our window. 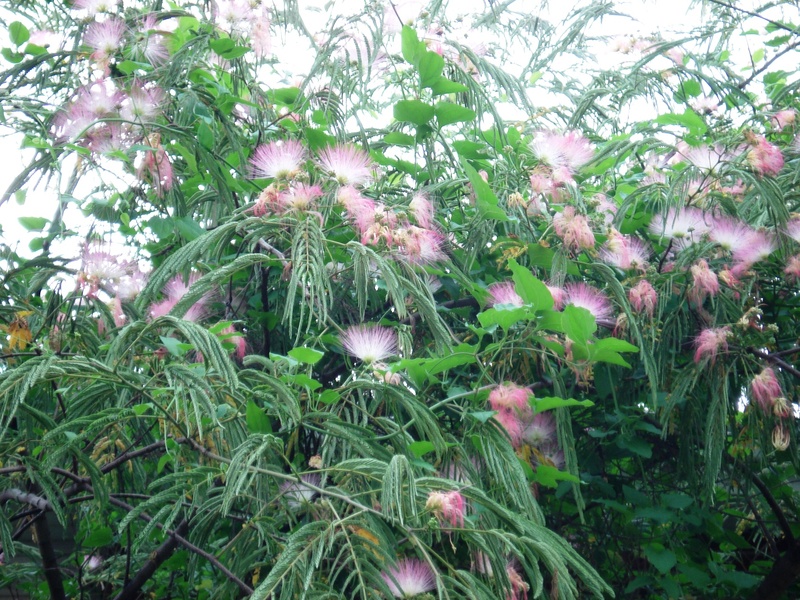 It’s a mimosa or china silk tree. They are a rather aggressive tree, growing madly and are considered an invasive species in some states. They also shouldn’t grow in our hardiness zone, but they do. Global warming, donchaloveit!